Ryan McLaughlin has been working on instruments since he started playing bass guitar at age 14. He went on to play double-bass, eventually attending the Brevard Music Festival as a bassist when he was 17. There, his counselor was the in-house luthier, and Ryan’s eyes were opened to what would become a lifelong passion. Ryan attended the Violin Making School of America in Salt Lake City, Utah. Upon graduating from the four year program in 1999, Ryan joined the staff at Michael Becker Fine Violins in Park Ridge, Illinois. 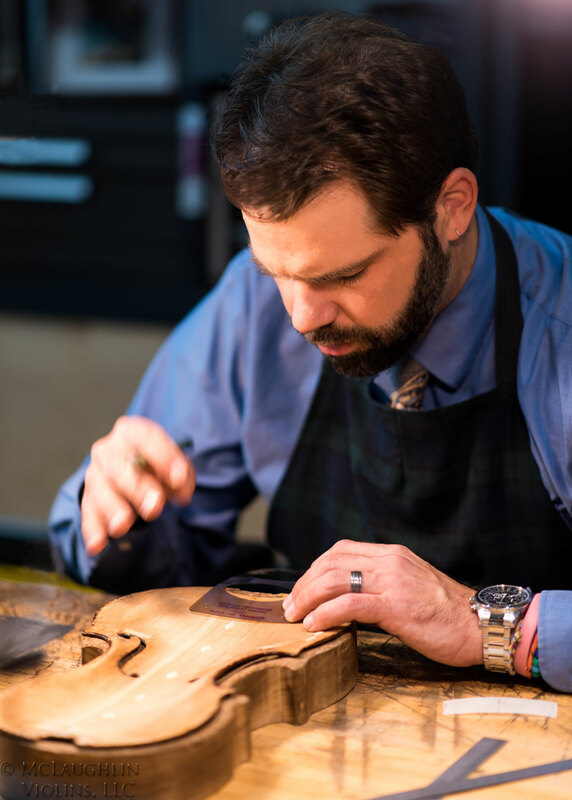 In 2006, Ryan moved to Atlanta to become the Workshop Manager at Williams Gengakki Violins. Since that time he started his own workshop, first in Atlanta, and now in Chicago’s Fine Arts Building. Ryan is a regular at the Violin Society of America’s (VSA) Violin Restoration Workshop in Oberlin, Ohio. There he has studied under the late Rene Morel, John Becker, Andrew Fairfax, Jerry Pasewicz, Joseph Grubaugh, Rodney Mohr, David Orlin, Jeff Holmes, Guy Rabut, Marilyn Wallin, and David Burgess. lü-tē-ər: one that makes or repairs stringed instruments such as violins, violas, and cellos. Ryan McLaughlin has served on the board of directors of the Violin Society of America, and the American Federation of Violin and Bow Makers. Having started playing the violin at the age 15, Sean has studied with some of the finest violinists the city has to offer. He can be found playing in recitals, various music festivals, Chicago orchestras as well as chamber ensembles for concerts and competitions. Sean has spent years carefully examining the art of learning efficiently as well as teaching. Zac began teaching himself guitar around the age of twelve. He played in several bands and eventually decided to take up the challenge of studying music in college. Realizing that he did not have a suitable guitar for the task, or the resources to buy one, he decided to make his own. This was the beginning of a passion for lutherie and fine woodworking. Throughout the course of his time at the University of Louisiana and Northern Illinois University, he made several more guitars, some of which he used at school and continues to use professionally. His journey into lutherie has led him to fine violins and to Mclaughlin Violins, where he is lucky enough to apprentice.